Papercamp souvenir, originally uploaded by toxi. Apple’s iPhone 3.0 announcements caused a kerfuffle today, but it seems to me insane that the thing that’s being talked about most is… Cut and Paste? 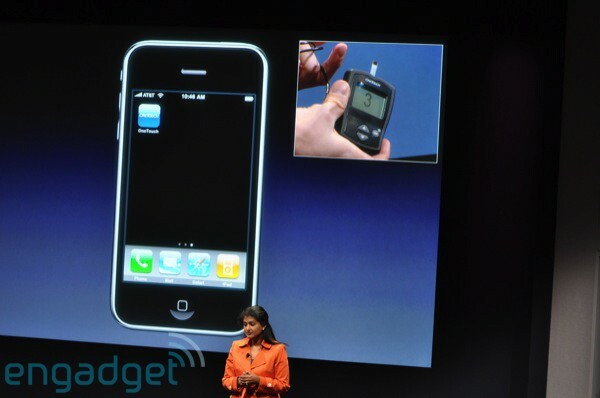 I mean – they’d announced that you could create custom UIs that worked with physical peripherals – they’d had someone from Johnson & Johnson on stage to show a diabetes sensor companion to the iphone – the nearest thing to AP’s Charmr you could imagine! A rapid prototyping platform for physical/digital interactions? 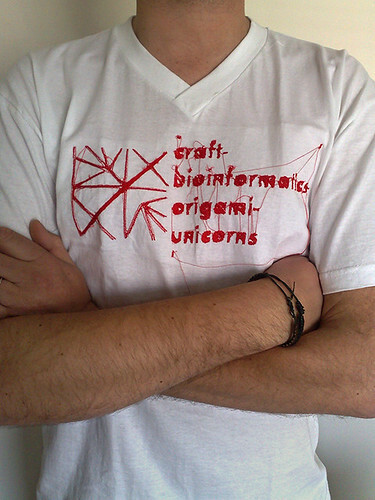 A mobile sensor platform for personal and urban informatics that’s going mainstream? Imagine – AppleStores with shelves of niche, stylish sensor products for sale in a year’s time – pollution sensors, particulates analysis, spectroscopy, soil analysis, cholesterol? All for the price of a Nike+ or so? Come on, that’s got to be more exciting than cut and paste? Tom Igoe points out in his comment correctly that I have been remiss in not mentioning Tellart’s NadaMobile project from late last year – which allows you to easily prototype physical/digital/sensor apps on the iPhone through a cable that cleverly connects to the audio jack. It’s also totally open-source. At the Long Now London meeting yesterday (my rough notes here) I asked Stuart Candy a question about the language he was using. I was intrigued that he was interrogating what ‘Future’ meant to people as part of his practice of exposing them to scenarios and futures in the hope of encouraging more habitual longer-term thinking. He said that he was interested in reclaiming the word “Future” from the more corporate and financial associations it’s had during late-capitalism. My question was prompted by the fact that Candy’s fellow futurist and friend-of-this-show Jamais Cascio has recently stated that he’s going to stop using the term “long-term”, swapping it out for “multi-generational”. When we talk about the long-term, the corresponding structure of language — and thinking — tends to bias us towards a kind of punctuated futurism, pushing us to look ahead to the end of the era in question while leaping over the intervening years. This skews our perspective. “In the long run, we are all dead” John Maynard Keynes famously said — but over that same long run, we will all have lived our lives, too. I’m increasingly convinced that, when looking ahead, the focus should be less on the destination than on how we get there. Yet that’s not how we discuss long-term issues. When we describe climate change as a long-term problem, for example, we inevitably end up talking about what it would look like down the road, after some “tipping point” perhaps, or at a particular calendar demarcation (2050 or 2100). Although there’s no explicit denial that climate change is something with implications for every year between now and then, our attention — our foresight gaze, as we might think of it — is drawn to that distant end-point, not to the path. This has made me think about the rhetoric of ‘futures‘, written, spoken – and as I mainly deal with – the visual and designed. The ‘punctuated futures’ we often imagine and illustrate. I’ve also recently been thinking about the ‘permaculture‘ movements that have been rehabilitated in recent times from their hey-day in the 60s and 70s. Permaculture thinking – looking for closed loops of living systems that have the fewest negative impacts as possible on the health and longevity of the systems that they are in turn embedded within – has often been characterised as at-odds with technology. As being anti-futurity perhaps. But it seems to me that recent trends in emerging technology, as illustrated at Etech ’09 (have a look at Phil Gyford’s notes over at Overmorgen) last week – personal and product informatics, the spimeworld, low-cost rapid fabrication, biomimicry, new materials, cradle-to-cradle thinking, eco-urbanism – understood and deployed in linked and learning systems thinking manner at small scales – say, through a more technologically-oriented approach to the transition towns concept might to address this. They would seem to be promising technologies of the multi-generational task ahead. Of the path, not the punctuated end-point. They could be forging Bionic Permacultures. Time to start illustrating them. 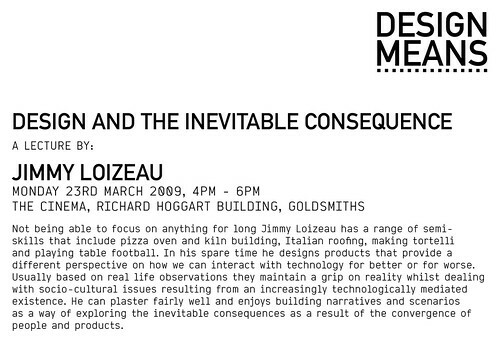 Design Means… Jimmy Loizeau, originally uploaded by mattward. More beautiful stuff from Timo and the crew. Stuart Candy on Ambient Futures at Long Now London, originally uploaded by moleitau. q: what drew you into the long now? (the hope is) this group is a group of early adopters of an idea which can get into the broader culture eventually? stewart brand: why haven’t we seen a picture of the whole earth yet? but – it’s not really the clock that is the central object – it’s designing culture around the clock… the clock is a catalyst for that. solution? : guerilla futures : ad-hoc incursions into futures. bruce sterling asked: what would happen if you changed ‘guerilla’ interventions into a regular standing army? Etech Day 1: Fancy meeting you in a future like this, originally uploaded by moleitau.